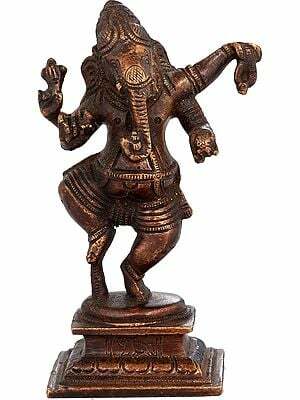 A delightful blend of a number of his forms in classical iconography, mainly Kshipra and Vijay Ganapati manifestations, this excellent statue represents Lord Ganesha as engaged in ecstatic dance. 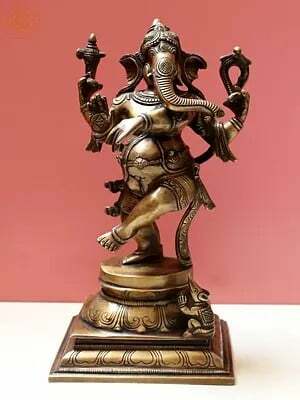 The quick acting Kshipra Ganapati, ever victorious Vijay Ganapati and Nritya-Ganapati – Dancing Ganesha, all bursting with divine energy, are his four-armed manifestations carrying in them goad, noose, broken tusk and sprig of Kalpavriksha, Vijay Ganapati holds in one of them a golden mango, and Kshipra Ganapati carries a pot in his trunk. 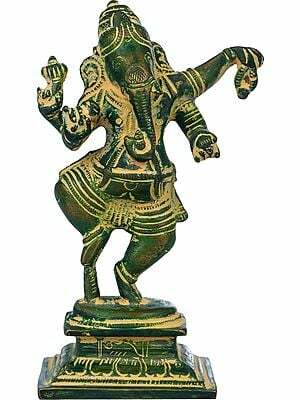 This brass image of Lord Ganesha anodized in copper for representing the image’s energy aspect holds in the fourth hand a pomegranate or a ‘modaka’ – a ball like shaped sweet, and like Kshipra Ganapati carries in his trunk a ‘purna-ghata’, a pot with a coconut and mango leaves atop. 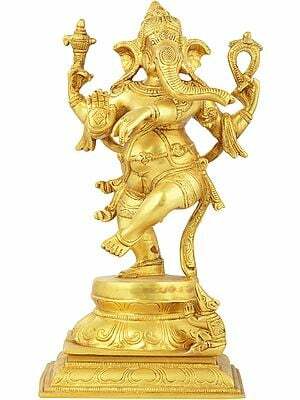 In Kshipra Ganapati form he holds a simple pot, not a ‘purna-ghata. 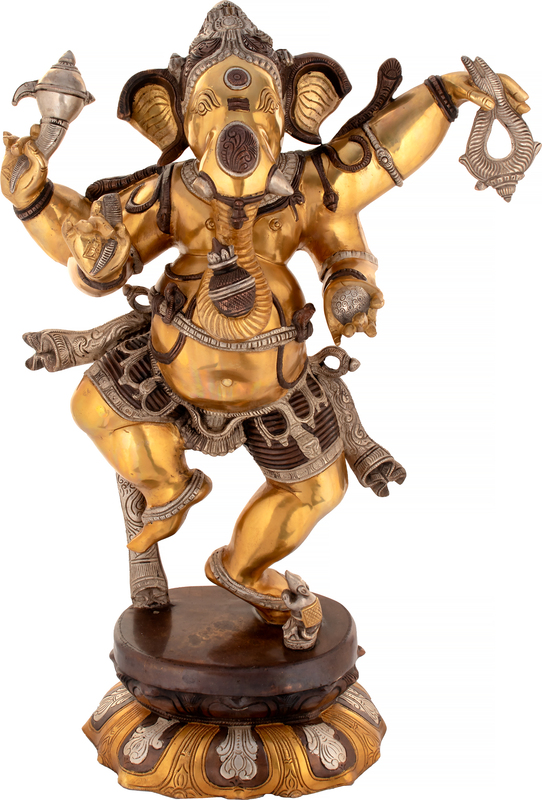 Though dance is the inherent idiom of his being – of his figure and spirit, even his seated forms revealing its one form or other, however mild and undefined, the classical tradition has identified one of his manifestations as dancing Ganesha, a form that reveals the total dance – a manifestation of dance as is this statue. 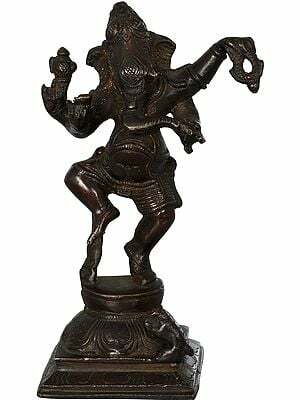 He dances fully absorbed with his body and soul, the entire being and every limb involved for bliss and good, not to destroy like his father Shiva, for subduing like Vishnu, or to annihilate like Kali. With his right foot flung into air, and left, lifted three-fourth, the blissful Ganesha is dancing fully absorbed. In contrast to his right leg his upper left arm is flung into air creating great visual effect. Correspondingly, not only his pot belly has moved to left but the pressure mounted on its right has given fourth along navel also a deep fold. Fully absorbed and in absolute bliss, his head has tilted a little to right. Except a little part of the left foot planted on the pedestal, and the right, held on a tiny support, the entire image stands on the pedestal without support. The artist has infused into his entire form, legs, feet and arms in particular, great vigour, tremendous energy and the beauty of movement bursting from every part of his figure. 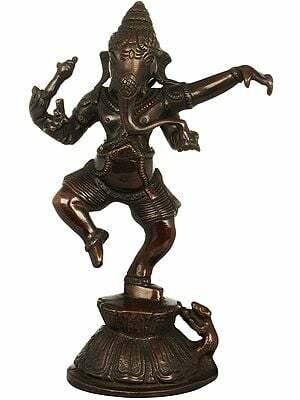 In context to Ganesha dance is the ultimate sublimation of movement which his form attains in its cessation and in absolute poise. 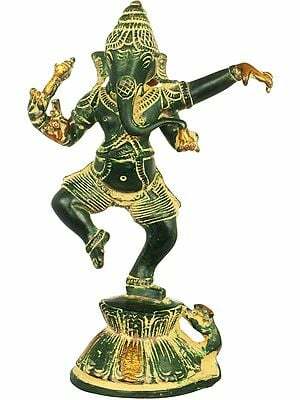 As in this statue, on the elephant god’s face ecstasy – ultimate of dance : the apex of movement, is absolute, and strangely as absolute is its cessation, a poise. 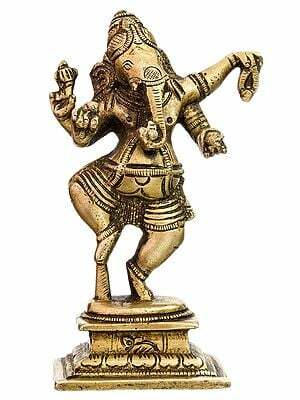 As a matter of fact, it is in its cessation that the dance of Ganesha attains its ultimate – its bliss, its ecstasy. 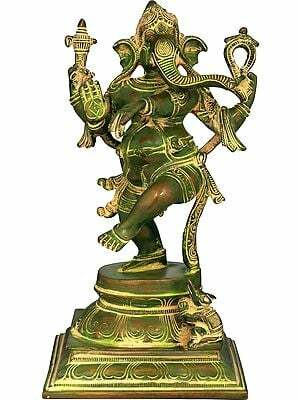 Exaltation or ecstasy that the form of the elephant god attains in cessation of movement is the essence of dancing Ganesha. In a ‘bhava-vibhora’ – blissfully absorbed state of his being movement ceases and stillness prevails but this stillness is also the ultimate sublimation of his movement – the energy crystallized. 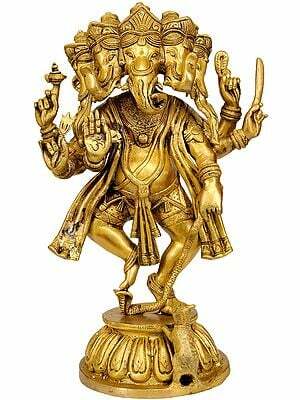 Not just movement or its pace the divine composure of his face defines his Nritya Ganapati image. A difficult anatomy : four arms with attributes in them, pot-belly, an elephant trunk his face and head, bulky figure with prominent muscles … is ordinarily a challenge to pack into any form. 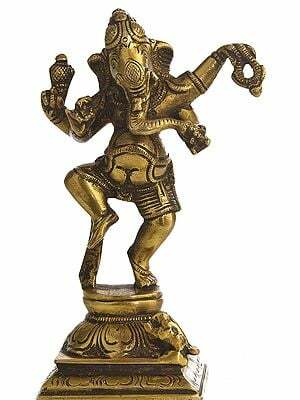 However, if such form has to manifest the dance of bliss and beauty, and that too in a detached statue raised over a pedestal just with one foot partially planted on it, the challenge is far greater. The artist has wondrously accomplished this challenge. 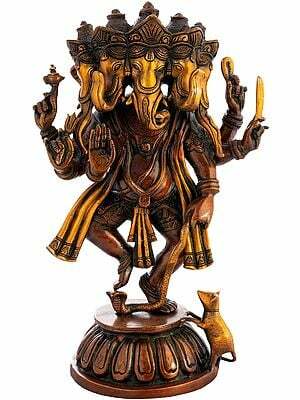 He has realized his form of Ganesha not merely as dancing but dancing effortless, spontaneously, by his own will and beyond a form. The image has been raised on a three-tiered pedestal, the bottom part, a rectangle, the middle consisting of a large lotus, and the top, a circular moulding. 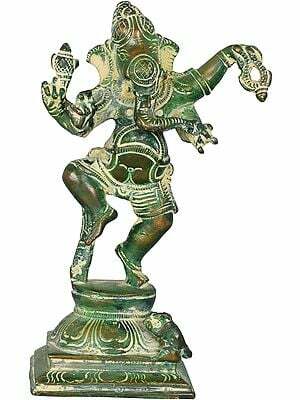 As usual, he is clad in a loincloth, besides a waistband, that being his sole ensemble, and a few ornaments. 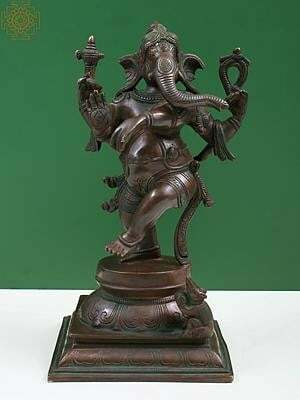 A tiny mouse, his mount, has been posted on one of the corners of pedestal close to the left foot of the elephant god.